As I mentioned in my last post, I was going to be on my way to attend the 2010 Sundance Film Festival in majestic Park City in Utah. The event lasts about 10 days and due to my schedule, we attended the last 3 days of the festival. My girlfriend, Angela, has a family friend named Brian Jones who owns a production company called Hanger 3 (http:\\www.hanger3productions.com) and has worked in the past as one of the volunteers at the Festival. Brian was attending this year in the capacity as a producer/director and had arranged for us to stay with him at a condo in nearby Midway. This was my first such event and I asked Brian, a man of seemingly infinite patience, what is the main focus of the festival, what are film makers trying to accomplish and how does one go about making a movie anyway? It turns out that there are quite a few applicants – probably in the thousands, of filmmakers wanting their film to be shown at the festival. Of those, about 200 are chosen to actually be shown at various theaters in the area. Some are feature length (80+ minutes) while others are short films (called “shorts”) and may be around 15 minutes in length. Few, if any, of the films submitted have been snatched up by a distributer at this point (like Lions Gate, or Miramax) but if it’s a feature film, that is the hope that it will get picked up. Shorts might get picked up for a DVD compilation or maybe shown on a Cable channel like Sundance or the Independent Film Channel (IFC). This is really about artists trying to get their work noticed, for the primary reason of getting yet more funding to go out and make another film. Brian drove us around in his rental car and when we weren’t talking about our Droid phones (we are both new owners) I questioned him about how one gets started in this highly competitive industry. One of my favorite film makers, Kevin Smith, made his debut with a feature called “Clerks” that was filmed in black and white at a convenience store at night where he worked during the day. That film launched his career and cost him about $25,000 to make. Clerks was shown at the Cannes film festival in France. So using that as kind of a base line, I asked Brian what was the complete bare minimum it took to make a movie. He said it could be be done for as little as $7,000 today, and that would involve people taking on multiple roles – Produce/direct, Sound and editing, a Grip (someone who makes sure the area to be filmed has electricity, etc) and camera rental. Gone is film – it’s all digital so the choice of filming in black and white to save money (like Kevin Smith did) no longer applies. The camera of choice today is the Red camera (“http://www.red.com/”). People use various software to edit cuts and audio. So with about $7k and 6 or 7 people, you can create a film. Of course, making a film that people stand up and take notice is the hard part. And that brings us to Sundance. The first movie that Angela and I got to see was “D0uchebag”. This was a comedy/drama done by Jonathan Schwartz, Super Crispy Entertainment and was a seemingly very low budget movie about a man, Sam Nussbaum, who is about to be married. His plans take a detour when he is reunited with his estranged brother by his fiancee, in the hopes that his brother comes to the wedding. This becomes a bit of a road film as the two take off to find his brother’s long lost 5th grade love. Comparisons to “Sideways” are inevitable here, although the focus is more on Sam and his relationship with his brother. While not as good as “Sideways”, the film was enjoyable and we the public were given a piece of paper to vote with. The four corners are marked “Fair”, “Good”, “Better”, “Best” and you vote by tearing the corner that best reflects your opinion of the film. After the film, the director came up with the actors for a Q & A session. It turns out the actor who played Sam was not an actor – he was an editor and the director wanted him to act this time. The director was very humble and gracious and they looked like a great group of people. On a side note, I noticed some of the band names that played on the soundtrack including “G*dd*mn Electric Bill” (asterisks mine). That is the most unique band name I’ve heard in a long time. The band is promoting the film on their website. 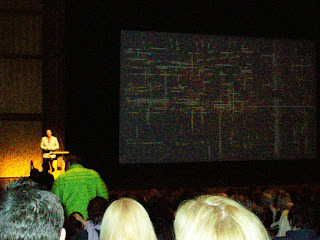 The next day we got to see a move called “3 Backyards” – a film by Eric Mendelsohn. At first I thought it was a “slice of life” kind of film, but although the story takes place in a single day, there are 3 parallel and non-intersecting story lines that all have a significant event that takes place. The first is a business man struggling with a marriage in jeopardy. He leaves for the airport and his flight is canceled. Instead of going back home, he uses the opportunity to just….hang out. He thinks, he observes, he lies to his wife and says he’s on a plane when he’s not. The second is about a young school girl who is trying on a bracelet that is to be a gift to her mother from her father. She can’t get it off in time for school so she wears it out the door – only to lose it. She has a interesting encounter with a dubious stranger to get it back. The third stars Edie Falco of Sopranos fame – she plays a house wife that is asked for a lift to the Ferry (these folks all live in Long Island) by a British actress who moved into the neighborhood. Edie is a gossiping, stay-at-home mom who dabbles in art and is thrilled at the prospect of becoming a friend and confident of this woman, but things don’t turn out as planned. One of the things that bothered me about this film was the sound track – no Electric bill band here, it was orchestral with shrill piccolo parts that hurt the ears. My girlfriend found the movie to be really intense and observed that the soundtrack was supposed to make you uncomfortable, like the glaring of the sun. Well, it accomplished that! When I looked at the online reviews on the Sundance web site, people either loved it or hated it, no middle ground. But it did win the directorial award from Sundance. Again, this was followed by a Q & A session with the director, who humbly wished he could continue to make more films. These guys aren’t Spielbergs or Camerons with unlimited budgets. In fact, more than one comment was made about “Avatar” by directors, usually in a comical reference, as their budget is probably 1/1000000 of that. We had some time to kill in between films so we got to explore Main Street in Park City, Utah. For those of you in northern California, the place had a bit of a “Grass Valley” feel to it, albeit colder. Lots of pubs, restaurants, and gift shops to check out. Our first two films had been at the Eccles theatre. It was fairly large, but with an odd set of rules. I could buy a soft drink out in the lobby, but when I tried to re-enter the theater, I was chased down by a woman who said to me “You can’t take that in there. Go back into the lobby and put the drinks in your pockets and come back”. Yes, I had to go back to the lobby, empty my pockets of my wallet and cell phone, stuff two large 32 oz Diet Cokes in my pockets (with the top of the bottles clearly showing) and waddle back to the re-entry point where they happily let me in. I’m not the kind of person to throw a fuss in public, but the ridiculousness of this rule was annoying, to say the least. Our third film was a midnight showing. It was a French film with English subtitles and looked very professionally done. It was called “Seven Days” and is one of the most brutal films I have ever seen. The story covers a small family of 3 – a surgeon living with his wife and 8 year old daughter. When his daughter is fatally attacked by a predator, he changes. Through some flimsy plot devices, the doctor manages to secure a deserted cottage home in the woods and kidnaps the arrested predator in transit and bring him to this remote location. There’s a reason for the hurried plot at this point. A countdown of 7 days commences, ending on the little girl’s birthday. Each day brings forth a new torture for this shackled man as the doctor goes down a road of insanity. Advertised as “not your average torture film”, I would have to agree. At least with “Saw” the torture of each character is short lived. Not in “Seven Days”. We endure everything from beatings with a chain to bizarre surgery. I am not one to close my eyes, but I had my hand ready at more than one point. Angela even asked me “Are you going to shut your eyes?” I nearly did. Marilyn was very warm and engaging and full of interesting stories. Friday was our last full day in Utah. We had one movie left to see – it was an 11:30pm showing. We looked around for other movies, but after 7 Days, we wanted something light and there just wasn’t anything like that that we could get to, so we hung around Park City all day, sampling the food and atmosphere, and picking up some souvenirs. The last movie was “The Perfect Host” and starred David Hyde Pierce. This was probably my favorite movie of the four. I can’t say that much about it, other than a criminal is trying to escape from the scene of a crime and he’s wounded. So he takes refuge in a man’s home, posing as a friend of a friend. From there, the story becomes a very nice balance of humor, wit, bizarre, and sometimes even creepy. As good as the humor is, you’re never convinced something bad can’t and won’t happen. After the movie, the director and David Hyde Pierce himself came up for Q & A. What a treat. Mr. Pierce seemed relaxed and joked around with the audience. You could feel the excitement in the crowd that here is someone who is an accomplished actor here to take questions. (No, I didn’t ask any!). The night was over, and we piled into Brian’s rent a car for the 20 minute drive back to our place. The next morning came early and we packed and got off to the airport with time to spare. As we made our way through security, they had body scanners in some lines. It wasn’t mandatory. But that was the line we chose so I said “oh let’s just do it”. I was told I could have nothing in my pockets, not even paper (but I could hold my boarding pass). So I get into this little tube thing (“Beam me up, Scotty! !”) where they had a marking where your feet go. I just put my hands against the greenish plastic tube and I was told “Not there – put your hands like in the picture”. Sure enough, there was a drawing of a man with his hands behind his head…the old “FREEZE! !” posture. So I did and the scan was done in seconds and I was free to find my shoes, my phone, my two carry-ons and get breakfast with Angela. The only unfortunate event was that while I was flying home, I realized I didn’t have my camera. It turns out I had lost it from somewhere in the theatre (my last photo was of David Hyde Pierce) and the airplane (although we looked everywhere). I have been able to get a few photos from my phone and some that Angela took, so I still have some nice photos for the memory. I contacted the lost and found email address for Sundance and they were very nice to me, but it hasn’t turned up. It was a Canon SD 1200 I had just purchased and was getting used to. It looks like I know what I’m going to get for my birthday – my last Christmas present. Oh well, it could be worse. All in all, it was a wonderful, memorable trip. The only thing I’d change is maybe take some time to ski while there. I’m not a great skier, but living in the San Francisco bay area and having to drive 3+ hours to snow makes the distant runs look very appealing. 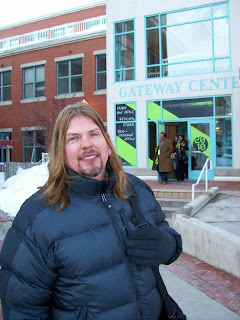 Park City is a charming town, the film makers were honest artists and we had a fantastic time.